Anna Zakas, MS, MPH, is an oncology genetic counselor at the Genetics Risk Assessment and Counseling Program at the University Hospital. 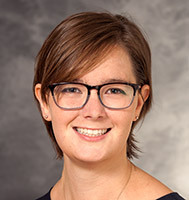 Anna works closely with professional teams at the UW Health Breast Center, Carbone Cancer Center, and the Digestive Health Center to facilitate patient care and to provide personalized risk assessment and understanding of hereditary cancer syndromes. She enjoys working with individuals and families to promote understanding of complex genetic and genomic information as it relates to disease. She received her master’s degrees in Genetic Counseling and Public Health from the University of Pittsburgh.